The Herbologies/Foraging Networks programme, previously focused in Helsinki (Finland) and Kurzeme region of Latvia, was presented outside of Baltic region for the first time during the ‘Return of the Pilots’ programme at International Society of Electronic Arts (ISEA) held in Ruhr region of Germany in late August 2010. We presented our production narratives and stories from Helsinki & Kurzeme, and then invited people to make a new language documentation about home-made herbal tinctures and teas in our workshop. The workshop outcomes are linked below. 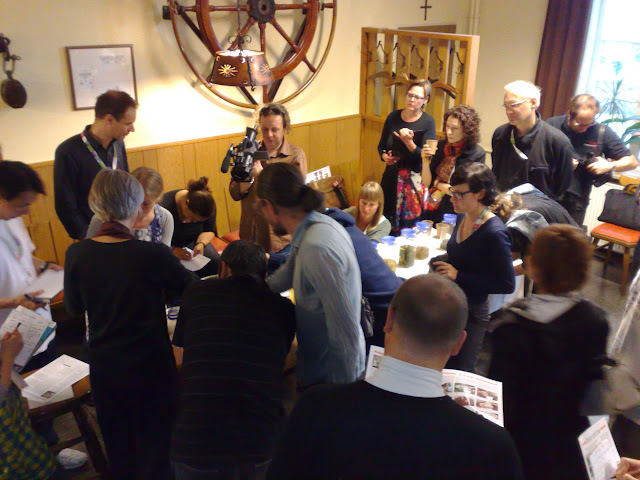 The workshop took place in a social room of St. Maximilian-Kirche, and was facilitated by Andrew Paterson, to produce different documentations of the Kandža/Bowl vodka technique demonstrated by Signe Pucena. At the beginning of the workshop, participants were invited to take different roles in documenting: photographers, videographer, note-takers, layout/processors of media. From the note-taking group, they agreed to make the notes in the following different languages: Chinese, German and Romanian. Currently the following documents have been made.. Coordinated and presented by Signe Pucena (LV) and Andrew Gryf Paterson (SCO/FI). Support from Ugis Pucens (LV), Ulla Taipale (FI/ES). Participants: Betty Schiel (DE), Escher Tsai (TW/UK), Verena (DE), Hajo (DE), Stephanie Görtz (DE), Anuschka Fritzsche (DE), Ana-Maria Huluban (RO), Anna Gerritzen (DE), Jiun Her (TW), Claudio Rivera-Seguel (CL), Monika van Ackeren (DE), Keith Armstrong (AU), Marc Dusseiller (CH).